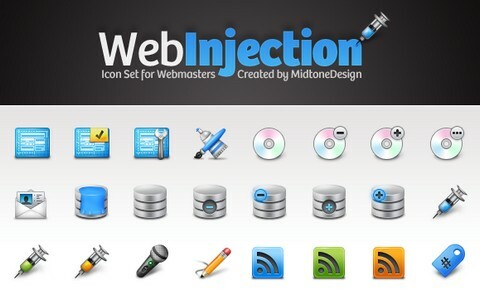 It includes 178 amazing web-related icons in a sophisticated and glossy design style. All 178 icons are available as 32×32 pixel PNG files and they are indeed pixel-perfect. It includes AIM, Bebo, eBay, Hi5, Last.fm, LinkedIn, Windows Live, Ning, Orkut and Yahoo Messenger. They includes 3 sizes for 17 icons: 128×128, 64×64 and 32×32. There is also an icon template PSD file included! The Social Network Icon Pack consists of 40+ 16 pixel x 16 pixel icons and 40+ 32 pixel by 32 pixel icons all in 32-bit PNG format. Social Network Icon Pack is licensed under a Creative Commons Attribution-Noncommercial-Share Alike 3.0 United States License. It contains 18 beautiful icons related to project management. The set includes the icons address card, bar graph, calendar, clock / time, conference device, contact, documents, draft, mail, marker, milestone, notes, portfolio, project plan / gant chart, search / find, sitemap / flowchart, todo and user / resource. 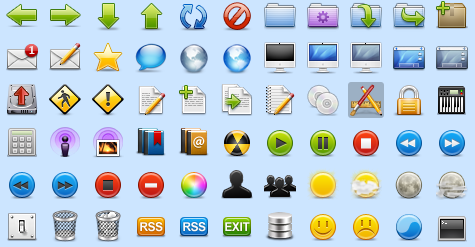 The set includes 26 stylish icons, each icon is a .png at 48×48px. It is free for use in your personal and commercial projects, and can be used without attribution. We have selected the best 5 sets of emoticons we have found on the internet. You can use them on your blog, forums and even web applications for free. J.max from Morcha has designed 9 glossy modern browsers icons including, Internet Explorer, TheWorld, Opera, Safari, Firefox, Netscape, Tencent Traveler, Maxthon and Google Chrome. All of them are in the size of 256×256px in Ico and Png format. Onur Oztaskiran of Monofactor released the full set of 30 3d isometric vector icons called Turqua. The icons are in both editable Illustrator 8 EPS (also viewable with late version of freehand and corel draw) and SVG formats. There are 2,374 icons are included in PNG format. The icons can be used free for any personal or commercial projects. It is a set of 128 glossy Icons Included some of the main Social Media Icons such as: Design Float, Digg, Delicious, Furl, Technorati, Flickr, Stumble Upon, Twitter and etc. They are only available in 48×48px. Do you need to represent weather conditions with some really nice images? Do you need some really nice weather icons for your web applications? If yes, you should bookmark this article for future use. We have found 2 sets of stunning weather icons, both of them are free for non-commercial projects. They look really stunning. And the loveliest part is, they are in scalable vector format. You can open the .ai file with any version of Illustrator above 8.0. With earlier versions, you might loose some of the effects on the icons. Application Icon Set includes Register, Settings, Users, Database, Login, Chat, Add, Delete, Edit, invoice. They are in PNG format with 128, 64, 48, 32px sizes. You can use these icons on any desktop and web applications. You can use them in your applications, in your toolbar, on your website. It’s entirely up to you. A credit or backlink is not required but appreciated. Package includes ICNS,PNG, TIFF, Mac Icons and Pixadex iContainer versions. Icon Drawer produced more then 220 flag icons representing countries and unions all over the world in PNG format. Sizes : 16×16, 24×24, 32×32, 48×48. They look so pretty. Here is a Flag Button Developement Kit created by Bartelme Design. We can create different flag buttons for different country easily. The package includes 30 PNG menu icons plus the additional source files for further customization. All icons are distributed under a Creative Commons Attribution Share Alike license. Feel free to use them in any form in your projects or even remix them. GNOME 2.18 Icons are in PNG ( Transparent background which can easily integrate into any web site) and SVG format ( Scalable which means you can increase the size of the icons without losing quality. There are over 600 icons altogether. Famfamfam offers us a set of wonderful and most pupular icons on the internet named “Silk” which contains over 700 16-by-16 pixel icons in strokably-soft PNG format. Tango Icon Library provides developers a set of professional high quality icons. They are in PNG ( Transparent background which can easily integrate into any web site) and SVG format. I like some of the icons. Thanks! Nice set of icons here, thanks! This is a great collection, thanks for taking the time to post it. iconPot has collected the links of thousands of free icons which are free for commercial and personal use (no attribution required). You might be interested. great ! great ! great ! many thanks for this ressource of icons. Very useful for webdesigners, thanks. great list, thank you very much. Gah! So many icons, I don’t know what to do! social icons looks lovely, well done and thanks for sharing, wonderfull. Wow, what a cool collection of icon sets. Thanks for putting this collection together. I really like all of these wonderful icons. This is the best place for a web designer. Live Long Web Appers …. Cheers. Best list of icons I’ve seen so far. Thanks!